As part of our acquisition takes place in Vietnam we periodically visit this country to take a tour of some of our factories. Below you will find the report from our purchaser Kurt Fierens, who visited in August. After a long flight, we arrive in Ho Chi Minh City (Saigon), the largest city in the southern part of Vietnam. We immediately notice the high humidity and heat (30 to 35°C). After all, we are in a tropical climate. 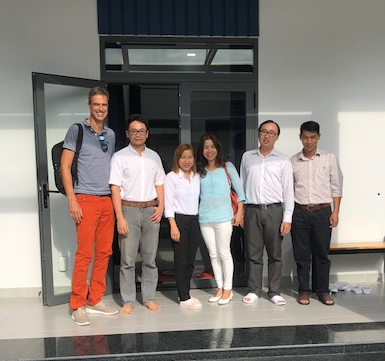 First, together with our Vietnamese quality inspector, we visit a producer of shellfish meat. The scientific name of these shellfish is ‘Paphia undulata’. This shellfish meat is an important ingredient of the seafood mixtures that we produce for some of our retailers. The meat has a lovely texture and a firm bite, it looks good and fits perfectly in the mixtures. Also, the price is more competitive than the price of cockle meat from our own waters. However, the availability is not evident – all the more reason to closely follow up on this reference. 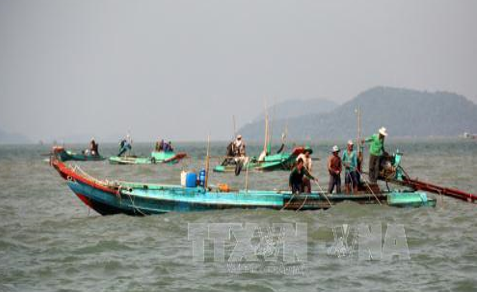 In any case, the Vietnamese government is closely monitoring the available biomass and water quality and decides during which periods it is allowed to fish for these shellfish. After a five-hour drive, we arrive in Soc Trang, where our producer is situated. Soc Trang is located in the Mekong Delta. Fortunately the roads in Vietnam have greatly improved, because this trip used to take seven hours plus two small ferries to cross the Mekong River. But once we arrive, we receive a very warm welcome. The company we are visiting produces mainly full shellfish, shellfish meat and octopus products. They achieve 80% of their sales in Europe. Their other markets are Japan (15%), America and Israel. 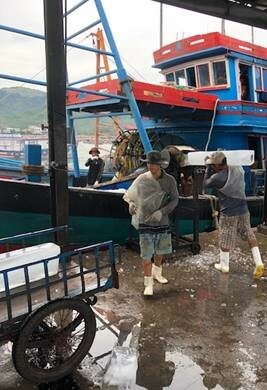 They have a total of 300 people working for them, but during busy periods with a large supply of shellfish, this could increase to 400. The company has its own laboratory and is IFS and BRC certified, which means that our products are processed under the best possible conditions. The shellfish are caught near the coast with small boats that have a crew of four to six people. They use dredging cages, which they tow across the sandy seabed on which the shellfish lie. After four hours of fishing, the boats return to the harbour and the shellfish are transported to the factory. The catch per boat is between two and four tons. 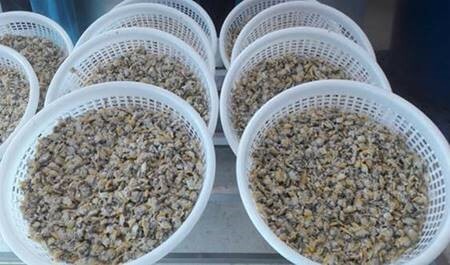 The shellfish are washed and any sand is removed and then they are inspected for broken shells and impurities. The shellfish are washed a second time and sorted by size. After a third wash, the shellfish are boiled in a cooking bath for at least four minutes. They then have to cool down in a cold bath for 10 minutes. Finally the meat is removed mechanically from the shells and checked again for any foreign particles. Before they are stored in the freezing tunnel, they are washed for one last time. After weighing, glazing and packing, the shellfish meat passes through the metal detector and then disappears immediately into the freezer. Before the goods are finally shipped to us, they are subjected to another double check by our Vietnamese quality controller. The products will be only shipped when all lights are green. 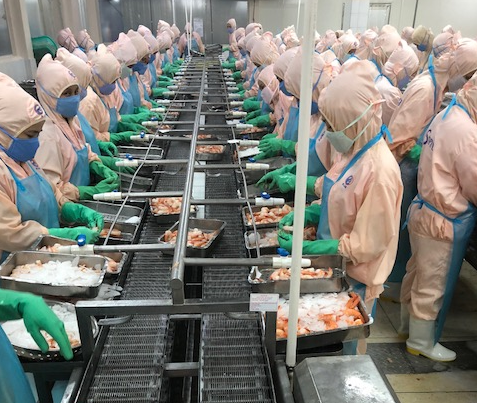 The next day we pay a visit to a large Vietnamese shrimp producer and processor, established in 1978. They produce Vannamei and Black Tiger shrimps. Here too, we receive a very warm welcome. They have two large production sites with a total of no less than 3500 personnel. This means that they can process 135 tons of raw material to 90 tons of finished product every day. In 2017 they achieved sales of 186 million USD with 17,000 of tons of finished product and this year their target is 190 million USD and 18,000 of tons. It is very impressive to see this hive of activity. The majority of their products are sold to America (40%), but Europe (30%) is also an important market. Their other markets are Canada (15%) and Asia. The first production site produces raw and cooked prawns, the second site produces prawn products with added value, such as tempura and torpedo. There is no lack of quality certifications here: the company is BRC, IFS, ASC, Global Gap and Halal certified. Following a five-hour journey back to Ho Chi Minh City, we visit a company focused on products with added value. This is not a small company either: they have 520 employees and they achieved 50 million USD in sales last year. They mainly focus on healthy, “ready-to-eat” food and are therefore extremely suited to our customers. This company sells 38% to Japan, 30% to Australia and 12% to Europe. They are aiming for more growth in Europe. When we visit the production area, we immediately notice the streamlined organization. This is no sinecure, looking at all the products in their product range: different kinds of marinated pangasius fillets, fish rolls with various fillings of sauces and vegetables, cubes of raw vegetables, tofu, fish balls, stews, fish brochettes, batter coated products… This company also has the important required certificates: IFS, BRC, Halal, Global Gap and ASC. After the professionally conducted guided tour we attend a tasting session and evaluation. We can already tell you that we have selected a number of products and are looking forward to receiving the samples. For the last part of our trip we fly to Nha Trang, a one-hour flight. Nha Trang is located in the southern part of Central Vietnam and is not only a major seaside resort, but it also has a fishing harbour. The main activity of this company with 800 employees is the processing of tuna. In particular the Yellowfin tuna (Thunnus albacares) and the Skipjack tuna (Katsuwonus pelamis) are cut and processed here in various ways and frozen, either raw or cooked. The company also processes other species of fish, such as swordfish, marlin, barramundi and mahi mahi. 40% of their tuna is exported to America, 30% to Europe and 30% to the Middle East. The raw material is mainly sourced from Taiwanese and Korean fishermen, who deliver the goods deep-frozen. This IFS and BRC certified company is also a major supplier of canned tuna to retailers and of cooked tuna to industrial processing companies.